An experimental instrument built by University of Maryland mechanical engineering student Josh Sheldon that uses back-driven stepper motors to synthesize sound. He had seen Martin Molin's Wintergatan Marble Machine video and was inspired to create a musical instrument of his own. Sheldon states that he watched all of the prologue videos documenting the process of building the marble machine and with the stepper motor idea floating around in his head, eventually the two ideas collided. The idea came a few months ago, when I was thinking about how stepper motors work and the idea occurred to me that steppers would probably generate alternating current when backdriven. I got an oscilloscope and I found that this was true, which was exciting because that meant that I could use stepper motors to generate sound. This is because AC is a wave, which is what sound is. If you amplify the signal and send it to a speaker, you can listen to it as sound. The frequency of the signal from the motor is proportional to how fast the motor is driven. So if you backdrive the motor at a high speed, you get a high pitch, and a low speed would give you a low pitch. The wave I got from my stepper motors was more or less sinusoidal, which meant I'd get sound similar to what you get from a sine synthesizer. 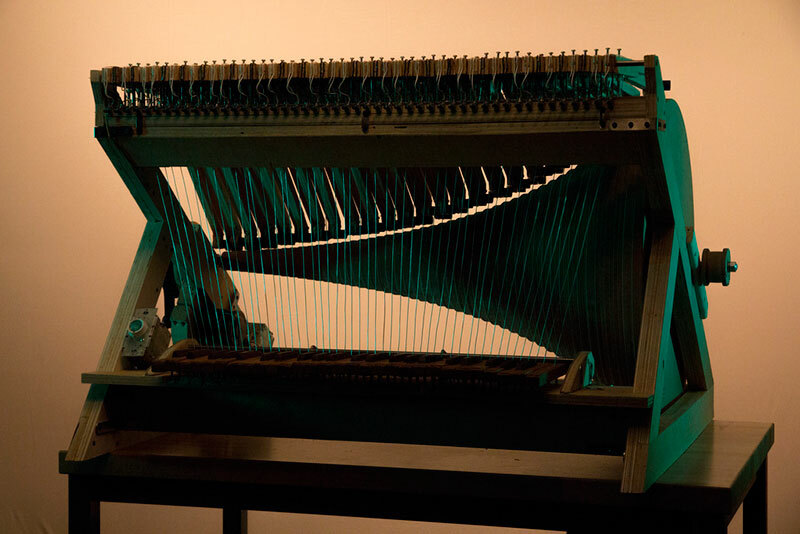 An experimental instrument built by University of Maryland mechanical engineering student Josh Sheldon that uses back-driven stepper motors to synthesize sound.